All currently enrolled students, faculty and staff of Reinhardt University have off-campus access to all of the library’s databases and electronic resources. 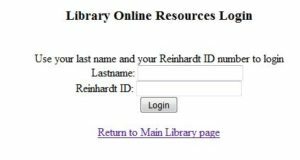 The library‘s Proxy Server allows authorized library users to gain remote access to these resources by using your Reinhardt ID number which can be found on your Eagle Card. Please contact the Public Safety Office at 770-720-5789 if you need a Reinhardt Eagle Card. How do I use the proxy server? When you choose a library database or electronic resource from off-campus, the proxy server will prompt you to enter your last name and your Reinhardt University ID number. Once the proxy server confirms you are an authorized user, you have full access to all the electronic resources and databases. Typically, you will need to only enter this information once during an online session. If you have trouble accessing the databases using the proxy server, please contact Joel Langford at jcl@reinhardt.edu or (770) 720-5585. Do I need to know the GALILEO password? You should not need the GALILEO password for access to GALILEO databases when going through the library's proxy server. If you access GALILEO directly through its website, you will need a password. You may contact the Library staff for the current GALILEO password. The GALILEO password normally is changed near the beginning of Fall, Spring, and Summer semesters. In the event that the proxy server DOES NOT allow access to the GALILEO suite of databases, you may go to GALILEO directly at www.galileo.usg.edu and enter the current password.